If you need specific help with your assistive technology, please refer to your local institution's website to find contact information for groups who can assist you with accessibility accommodations. Sakai has a responsive design to adapt to different screen sizes, so certain elements only display when an internet browser window is larger than 770 pixels in width. In the descriptions below, Desktop View will be used to refer to the display when an internet browser window is larger than 770 pixels in width. Mobile View will refer to the display on smaller windows. Content - This access key takes you to the area that contains the site where you are working. Tools - Every Sakai site has a Tool Menu with a list of links to the current site's tools. My Sites menu - After you log in, you can use this menu to access your active sites. The information on Access keys in this note provided by WebAIM.org (opens new window). You can learn more about Access keys on their website, Keyboard Accessibility © WebAIM (opens new window). Location: The quick access links are the first three links on the page. They are announced by text-to speech software after the page title. Pictured above is how one of these (normally invisible) links displays on the page if you navigate using the Tab key on your keyboard in Chrome after logging in to Sakai. When logged in on Desktop View, the Sites menu follows the access key links, replacing the Login links. On Mobile View, the Sites menu follows your profile picture and name (described below). You can expand the Sites menu to access your active sites. 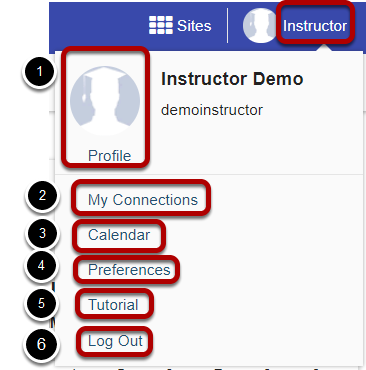 When logged in on Desktop View, your profile picture (which displays a silhouette of a student with a graduation cap by default) and name follow the Sites menu. On Mobile View, your profile picture and name are at the top of the screen. Your profile picture and a Profile link that you can select to edit your picture or profile. A My Connections link that will take you where you can search for, add, and manage your connections. A Calendar link that will take you to your aggregated calendar for all enrolled sites. A Preferences link that will take you to a page where you can edit your Sakai notifications, time zone, language, and active sites. 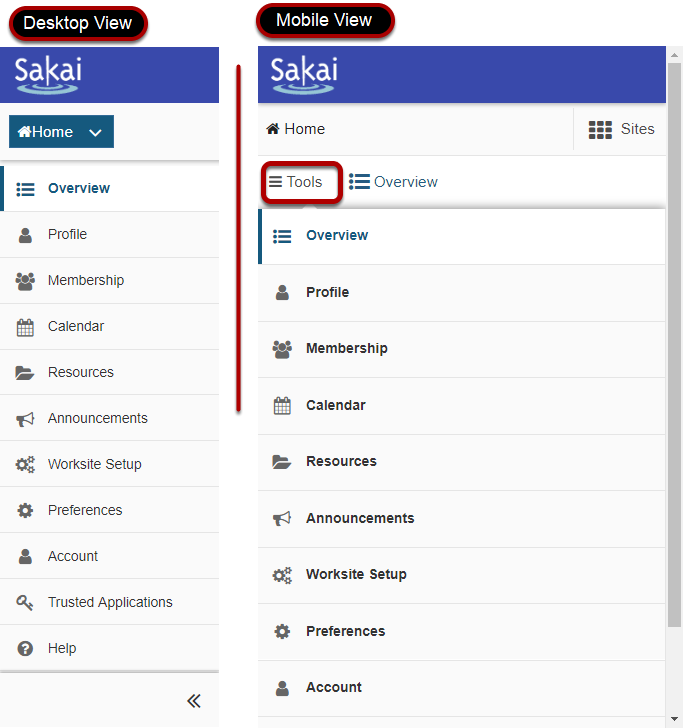 A Tutorial link to start the Sakai introductory tutorial (this tutorial also appears the first time you log into Sakai). A Log Out link to log you out and take you to back to the Gateway page of Sakai. Location: On Desktop View only, the favorite sites list appears after your name. This list contains the links to sites you most commonly use. You can select which sites appear in the list by selecting them as Favorites from the Sites menu. Each favorite site's tab will either take you to the site, or if you Tab into the menu and press the Down arrow key, supply you with a submenu of that site’s tools so that you can go straight to that tool on the selected site. If you have a large number of favorite sites, only the first ten sites will display in this list. Location: On Desktop View, the Tool Menu appears to the left of the screen. On Mobile View, it can be accessed by selecting Tools near the top of the screen. Pictured above is the Tool Menu of a Home site, in both Desktop View and Mobile View. Note: The Help tool will always be present as the last item in the Tool Menu no matter what site you are on. This enables quick access to the Sakai help documentation. Location: On Desktop View only, at the bottom of the screen underneath the Tool Menu is a button to collapse or expand the menu. When collapsed, the Tool Menu displays with icons only, no text. The Expand/Collapse Tool Navigation button display switches between << (to collapse the Tool Menu) and >> (to expand the Tool Menu), depending on the state of the menu. 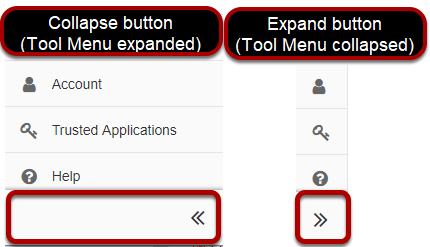 Note: Using the Expand/Collapse Tool Navigation button will have no effect on page navigation for users of screen reading software as all tools will still be available and announced. The content comes after the Tool Menu. Location: On Desktop View, the content displays to the right of the Tool Menu. On Mobile View, the content appears underneath the Tools link. The title of the tool you are currently viewing. This is also a Refresh Tool link that returns you to the main page of the tool when clicked. Pictured above is an example of an Assignments (Refresh Tool) link. The title will be followed by a Help button, which opens a new tab or window (depending on your internet browser preferences) with help documentation for the current tool. Accessibility Information, which displays the accessibility help documentation. The Sakai Project and Powered by Sakai links, which take you to the Sakai LMS website. Copyright information for the Sakai software. Build Info, which can be expanded to display the version of Sakai currently running. Server Time, which can be expanded to display the local time for the server. In most areas of Sakai where text can be entered, you can use the Rich-Text Editor to edit and format your text, and to add links, images, or media. Steps to access the Rich-Text Editor's toolbar with a keyboard are included in What are some keyboard shortcuts for the Rich-Text Editor? If you need a higher level of magnification, or if you need to have the cursor/pointer augmented, you may be more comfortable using a third-party magnifier such as MAGic (opens new window) or ZoomText (opens new window). To change color and contrast settings, use the operating system settings, browser settings, or your preferred browser plug-ins. If you need further help, please contact your local institution's accessibility support resources. Next: What does it mean to make content accessible?